Chinese authorities have released four Tibetan monks from a labor facility several months before of the completion of their sentences. Authorities in northwestern China’s Qinghai province have released four Tibetan monks from a re-education through labor facility several months ahead of the completion of their sentences, according to Tibetan sources in exile. Three of the four—Lobsang Nyima, Lobsang Samten, and Sonam Gewa—had been accused of leading protests on February 8 at the Nyatso Zilkar monastery in Tridu (in Chinese, Chenduo) county in Qinghai’s Yulshul (Yushu) prefecture, Lobsang Sangye, a Tibetan living in exile, told RFA’s Tibetan Service on Tuesday. They were detained on February 13, 2012, and were released on July 18, July 23, and July 25 this year, respectively, Sangye said. The fourth monk, Tenzin Sherab, was taken into custody on October 1, 2012, after being accused of publishing a newspaper called Marjen, or Exposed, “which was described as having political overtones and content related to self-immolation protests,” Sangye said. Tenzin Sherab was released on July 15, 2013, Sangye said. Separately, the Dharamsala, India-based Tibetan Centre for Human Rights and Democracy (TCHRD) confirmed the men’s release, adding that Lobsang Nyima and Sonam Gewa had also been forced to perform “excessive” hard labor in the camp. “They had to do some glass work and had to make 650 gloves every day,” TCHRD said. Lobsang Samten found the camp’s daily mandatory military exercises the “most difficult part” of his experience, the rights group added. 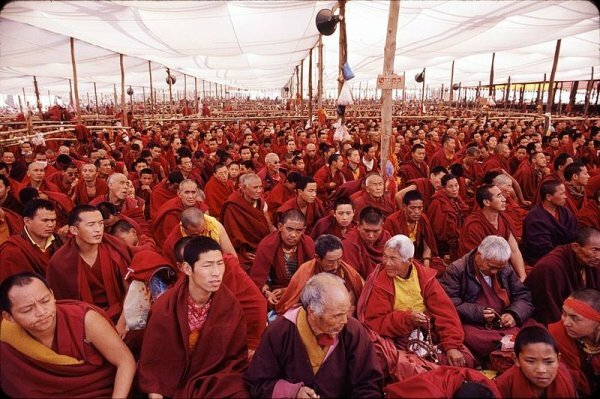 On February 8, 2012, about 400 monks from Nyatso Zilkar monastery in Tridu county launched a seven-mile “solidarity” march but were stopped by security forces halfway at a bridge, angering local residents who then joined the demonstration. “Chinese [forces] pressured the monks to stop the march, and at that point around 1,000 local residents joined the protests and raised slogans for up to three hours,” one local source said. The monks carried large banners calling for the Dalai Lama’s return to Tibet from exile in India and urging the Chinese authorities to release “innocent” Tibetan prisoners, sources said. Sporadic demonstrations, including a wave of self-immolations, challenging Beijing’s rule have continued in Tibetan-populated areas of China since widespread protests swept the region in 2008.